Fault-Tolerant Systems is the first book on fault tolerance design with a systems approach to both hardware and software. No other text on the market takes this approach, nor offers the comprehensive and up-to-date treatment that Koren and Krishna provide. 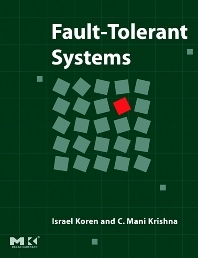 This book incorporates case studies that highlight six different computer systems with fault-tolerance techniques implemented in their design. A complete ancillary package is available to lecturers, including online solutions manual for instructors and PowerPoint slides. Students, designers, and architects of high performance processors will value this comprehensive overview of the field. Senior undergraduate, graduate students in fault-tolerance computing courses. Professional architects of high performance processors, and designers of enterprise computing systems. Israel Koren is Professor of Electrical and Computer Engineering at the University of Massachusetts, Amherst. He is a visiting Professor at the Instituto De Informatica, Universidade Federal do Rio Grande do Sul (UFRGS), Brazil. Previously he held positions with the Technion - Israel Institute of Technology, Haifa, the University of California at Berkeley, the University of Southern California, Los Angeles and the University of California, Santa Barbara. He has been a consultant to several companies including Analog Devices, AMD, Digital Equipment Corp., IBM, Intel, National Semiconductor and Tolerant Systems. Dr. Koren's current research interests are Fault-Tolerant Systems, VLSI Yield and Reliability, Secure Cryptographic Systems, and Computer Arithmetic. He publishes extensively and has over 300 publications in refereed journals and conferences. He is an Associate Editor of the Sustainable Computing: Informatics and Systems Journal. He has been a Co-Guest Editor for several IEEE Transactions on Computers special issues on Fault Diagnosis and Tolerance in Cryptography, Sept. 2006, on Computer Arithmetic, July 2000, and on High Yield VLSI Systems, April 1989. He served on the Editorial Board of these Transactions during 1992-1997, the Editorial Board of the IEEE Transactions on VLSI Systems during 2001-2006, the Editorial board of the IEEE Computer Architecture Letters during 2006-2010 and the Editorail Board of the VLSI Design Journal during 2006-2016. He also served as General Chair, Program Chair and Program Committee member for numerous conferences. Dr. Koren is a Fellow of the IEEE and a Master of the DeTao Masters Academy, China. C. Mani Krishna is Professor of Electrical and Computer Engineering at the University of Massachusetts, Amherst. He received his PhD in Electrical Engineering from the University of Michigan in 1984. He previously received a BTech in Electrical Engineering from the Indian Institute of Technology, Delhi, in 1979, and an MS from the Rensselaer Polytechnic Institute in Troy, NY, in 1980. Dr. Krishna's research interests are in the areas of cyber-physical systems, real-time and fault-tolerant computing, and distributed and networked systems. He has also been an editor on volumes of readings in performance evaluation and real-time systems, and for special issues on real-time systems of IEEE Computer and the Proceedings of the IEEE.